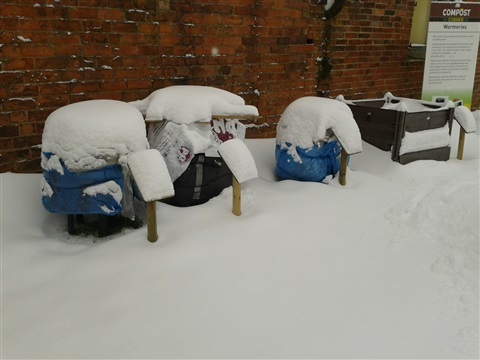 With the coming of winter most composting processes slow down or stop as a result of the cold weather but there is no reason to stop feeding the compost heap or bin in preparation for an increase in microbial activity when spring eventually puts in an appearance. 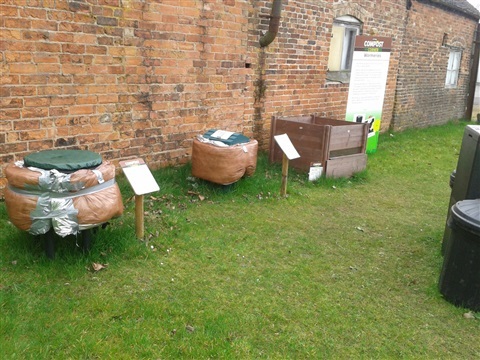 However you may like to try to keep the composting process working over the winter to increase your yield and as a challenge to show your composting skills. 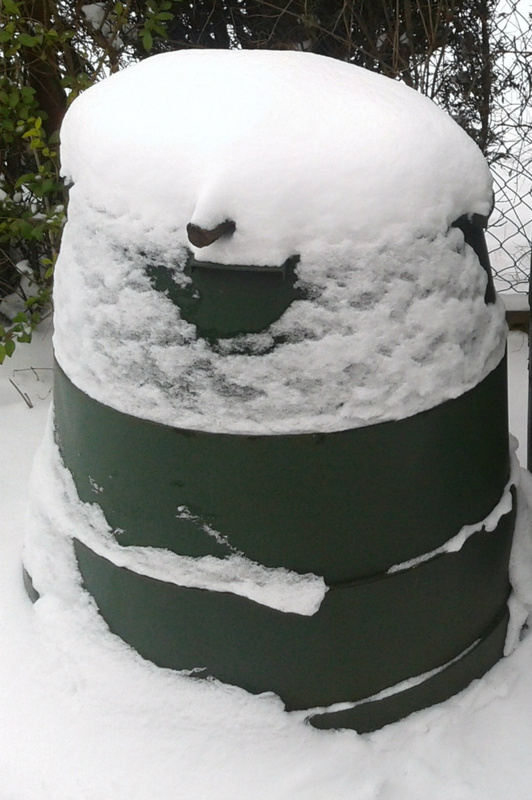 The use of a commercially available insulated bin, such as the Hotbin or Biolan, will mean that while the composting process may slow a little it should continue during the cold weather. 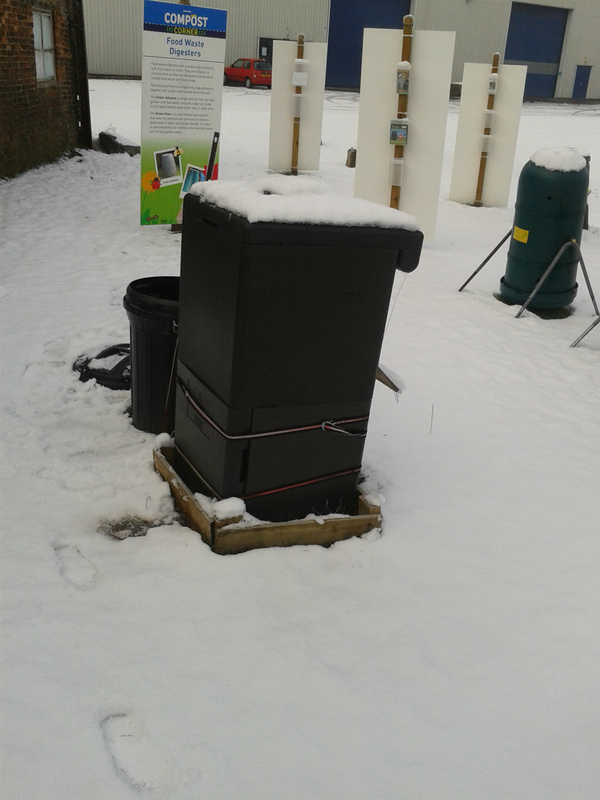 Alternatively with a little work ordinary bins can be insulated so that they continue the composting process over the winter months. If you continue feeding the heap or bin with the right mixture of greens and browns the rotting process will continue generating its own heat all that is required is that as much as possible of the heat is retained. One of the keys to success is the size of the bin, or heap, it needs to be at least 1 cubic metre (1.3 cu yards) to provide the critical mass for thermophilic organisms to keep working. 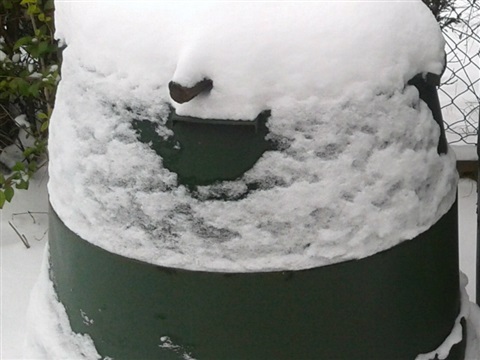 Unless insulated to a very high standard a smaller bin or heap is likely to be frozen while one that falls to near freezing will not remain active. The first approach to prolonging the working period is therefore to increase the size of heap to encourage the composting process continues longer into the winter season. 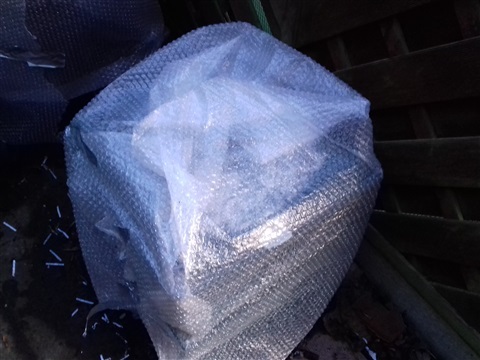 It will also be advisable to site the heap or bin so that it is in full sun to take advantage of any external heat. Covering the compost heap with a tarpaulin or carpet avoids it becoming waterlogged with cold rain and may slow the loss of heat generated but this is not enough to keep the bin working, insulation is necessary to keep the bin functioning during the colder months. 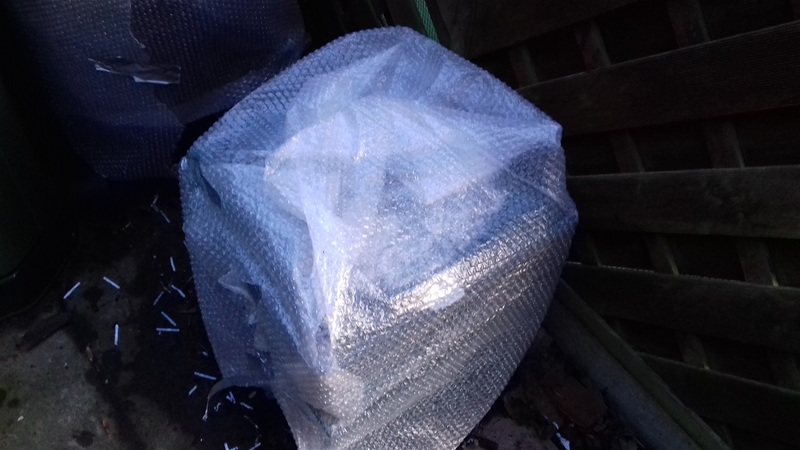 Old carpet, flattened sheets of cardboard or polythene sacks filled with straw or loft lagging ( sealed in a plastic bag to keep it dry) or layers of bubblewrap will help retain the heat if wrapped round a plastic bin or wormery. While cold weather will slow the compositing process the insulation should maintain the crucial microbial activity inside the heap or bin. The microbial action of the bacteria, fungi, and actinomycetes causing decomposition of the material in the bin will produce heat as a by-product of the chemical process. The bin insulation should mean that this heat is retained. 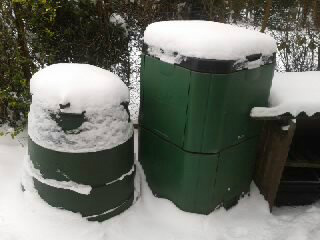 During the winter fresh waste materials must be added continually to keep the bin at working temperature. It is also recommended that more care is taken to layer the browns and greens. The layers help insulate the heap and retain heat. Shredding or tearing the materials to less than two inches in size has been shown to assist in heating the heap uniformly. Straw, fallen leaves (saved in sacks), shredded newspaper, or sawdust can provide a source of carbon. In addition small amounts of wood ash can are added to increase the calcium, phosphorus, and potassium content of the finished compost. The main source of nitrogen rich materials during the winter is likely to be kitchen scraps as little will be available from the garden. A good supply of vegetable and fruit peelings is essential. It may be possible to supplement your kitchen waste with some from neighbours. Used Coffee Grounds, provide an additional boost and may be obtainable from a local cafe. Moisture is one of the key factors in the composting process and winter winds and low humidity can dry the compost heap or bin. During warm spells warm water could be added to dampen but not soak the compost if it appears to dry. 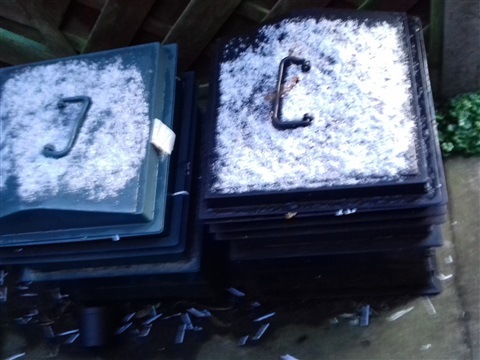 Aeration and turning the compost is not recommended by some sources during the winter as this will interfere with the insulation that you’re careful layering of the bin has produced and let cold air into the material. 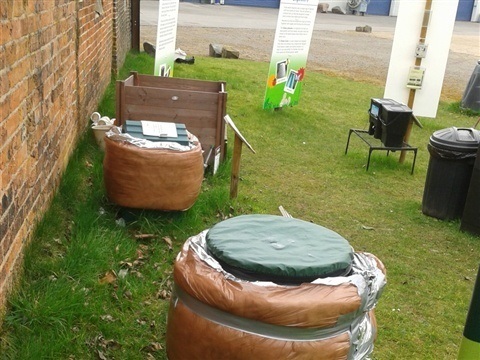 However others recommend aeration as a means of getting air into the heap which should activate the aerobic micro-organisms and producing heat to maintain the composting process. Rather than using an aeration tool it might be better to empty and refill the bin to ensure a god mix. 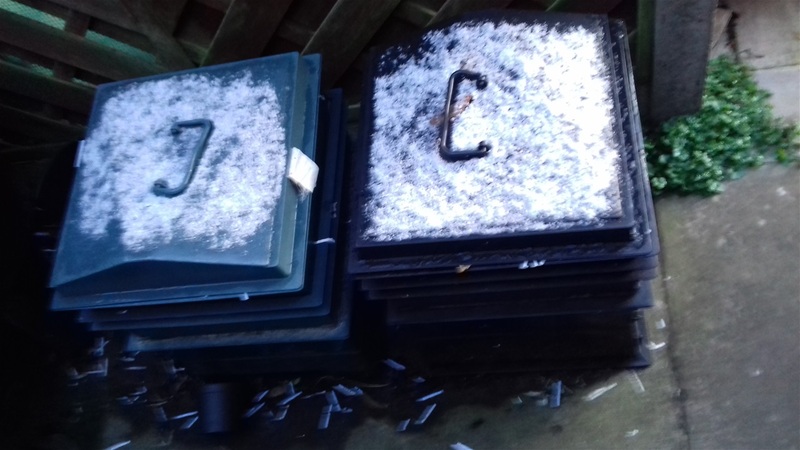 If a two or three bin system is being, for what in the spring and summer would be hot composting, when moving the compost from one bin to another ensure that the material at the side of the bin is added towards the the middle of the new bin so it composts evenly. 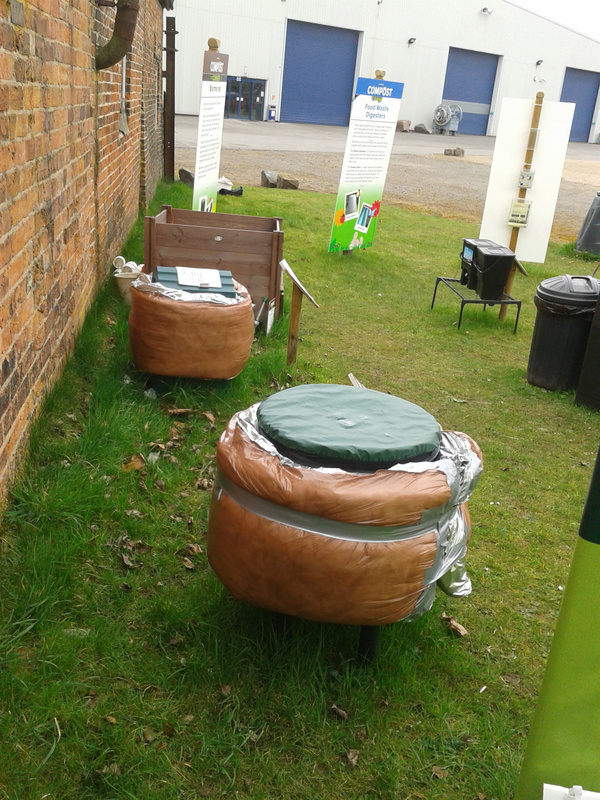 As an alternativeto continuing to use the compost bin Trench composting, in which a trench is dug and filled with kitchen scraps over the winter offers a simple method of composting over the winter months. Although it has fallen out of favour as a composting method, other than for creating a bean trench and for marrows etc, it is still worth considering as a means of composting uncooked kitchen waste. 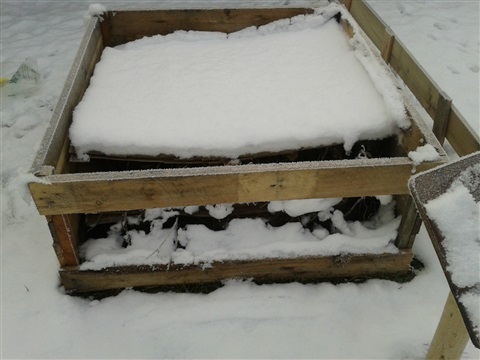 One of the indoor methods of composting such as a Bokashi bin or a wormery will reduce the need to venture into the garden during the winter. This of course assumes that the wormery is moved into a shed, garage or outhouse for the winter and not wrapped in insulation and left in the garden.